Not just hearing, but translating innovations and insights is a huge part of the value of the Total Customer Experience Leaders Summit. Our unique idea gathering wrap-ups between sessions facilitate alignment of customer strategy inspiration with business relevant actions and have been one of our most highly rated features in the past. Here on the blog, we'll be presenting weekly idea gathering wrap ups of some of our favorite customer experience strategy, design and alignment news and views. This week, let's talk about what seems to be a huge hot topic for 2013: Big Data. "Big Data" has made an appearance on a lot of year-end and year-to-come lists as a hot topic to watch. CMS Wire named 2013 "The Year of the Customer and Rise of the Data Driven Marketer." and Temkin group included "'Big data' predictive insights." in their list of 13 Customer Experience Trends to Watch in 2013. In 2013 Predictions: The impact of big data for carriers in 2013 on RCR Wireless News Robert Rich, Managing Director, TM Forum Insights Research wrote that "big data is certainly among the most important forward looking topics for business and IT organizations in service providers today, and it will remain among the top issues/initiatives for the foreseeable future, including of course 2013." 1to1media published "The Customer Experience Crystal Ball: Predictions for 2013" and noted that "organizations continued to grapple with the gargantuan amounts of customer data" in 2012." But back in December, Kerry Bodine, vice president and principal analyst at Forrester Research wrote on the 1to1media blog "Companies that become mesmerized by Big Data put themselves at risk of spending enormous amounts of time and money amassing new data sources -- and, in the process, forgetting that research methods like observation and one-on-one interviews even exist. This has the potential to create a large, and exceedingly expensive, blind spot." Here on the blog, I recently spoke with TCEL keynote Chris Frank about data in our Customer Experience Experts podcast series. This week also saw data expert, Nate Silver, the founder of FiveThirtyEight, taking questions in a Reddit Ask Me Anything thread. Lastly, our current LinkedIn poll is looking for your opinions on customer data: vote today! 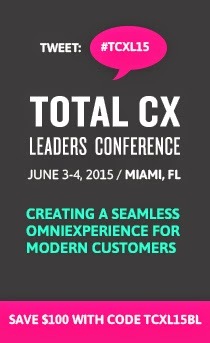 For more conversation on topics like this, join us at the Total Customer Experience Leaders Summit: register as a reader of our blog with code TCEL13BLOG to save 15% off the standard registration rates. Visit the webpage to register today.